Yesterday, I uttered the words every husband hates to hear: "We need to make some changes around here!" Men hate to hear those words. Because that usually means there is a "honey do" list for them not far behind. The good news for my husband is that this change didn't require his help (I had other projects for him, like installing a new toilet seat). Since the weather has been so cold and dreary for the past few months, I decided to give the dining room table a little update. I created a centerpiece vignette using things I have found over the years and picked up 1 or 2 little extras, so cost was minimal. 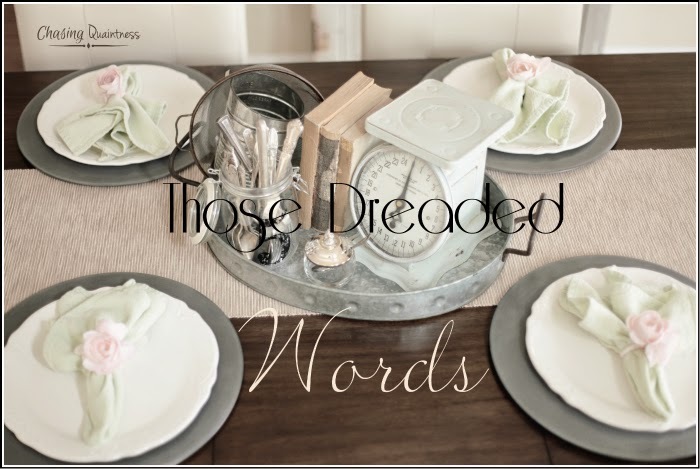 I love vignettes and think they are the easiest way to decorate an area. 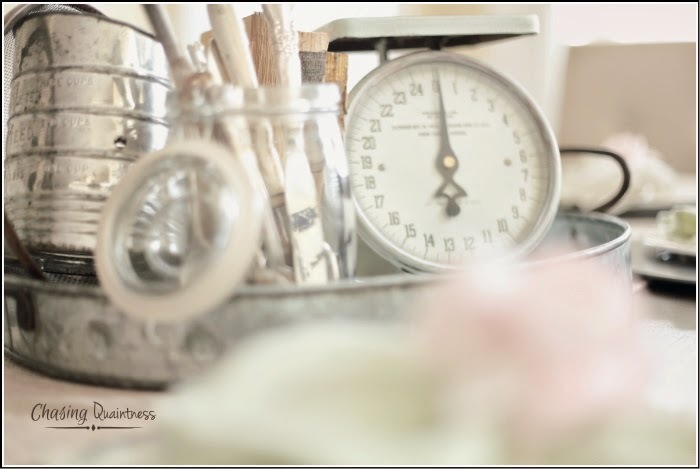 Small vignettes around a room add a punch of interest. For the table, I wanted something vintage. I had the metal tray and started with that as a base. 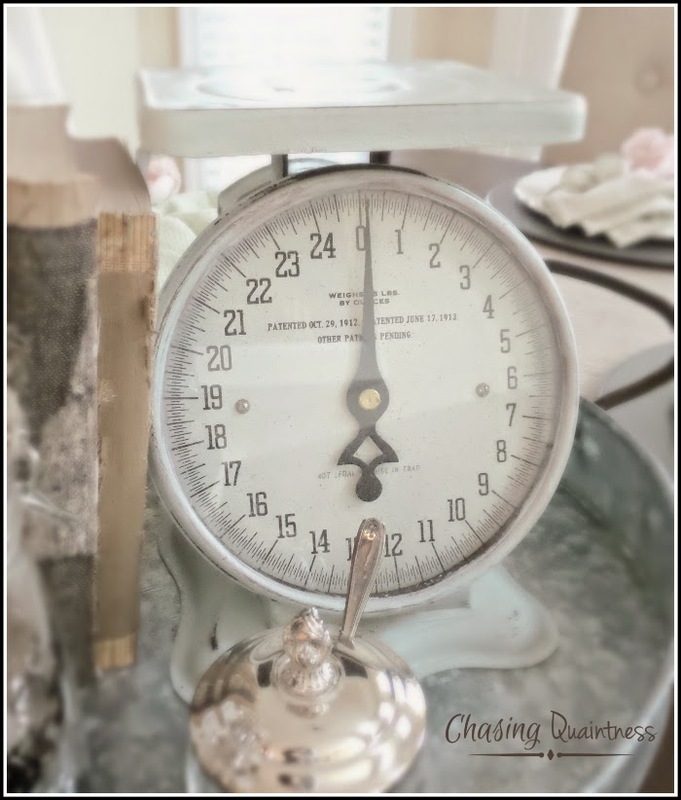 I found this wonderful scale at a local flea market and knew it would be my focal point. I had the books, silverware and marmalade jar. 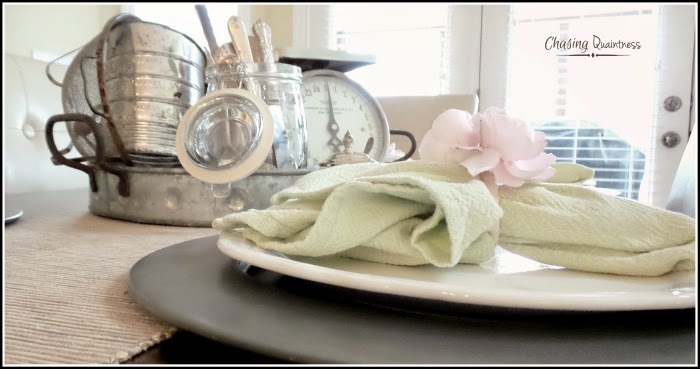 I found the vintage strainer (see the top photo) at the local Goodwill for 99 cents...it was perfect for this vignette. When I find the right plants I want to kill, I will use it as a coffin.....uh, I mean, planter. 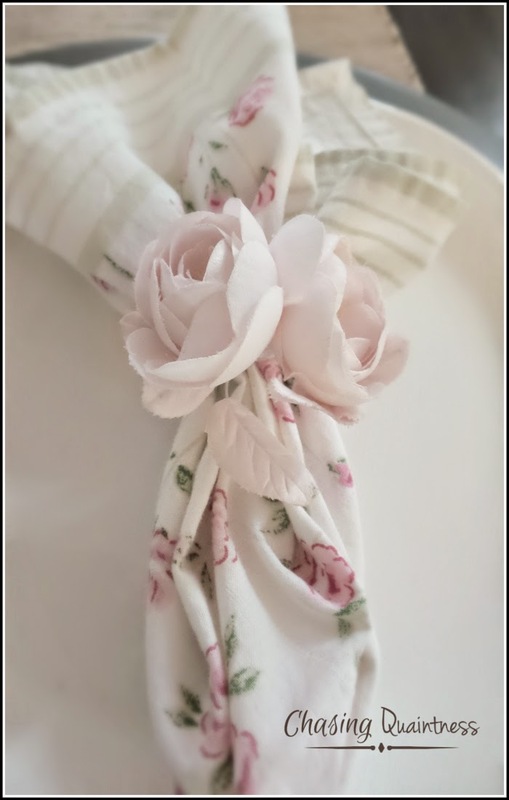 The napkins, along with the napkin rings, I have also had for many years. They were from the Shabby Chic collection at Target. They are no longer available and I'm so glad I've held on to them. 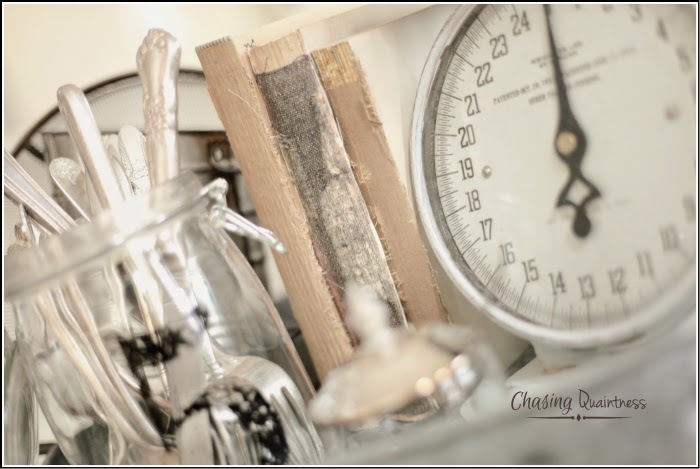 The numbered jar was a find at Tuesday Morning, another great store for treasure hunting. I think it turned out rather cute and simple for a vintage centerpiece. Each dinner guest is able to see the other and have a conversation without having to peer over something exceedingly tall or bulky. Maybe our guests will actually talk about the centerpiece! What do you think? 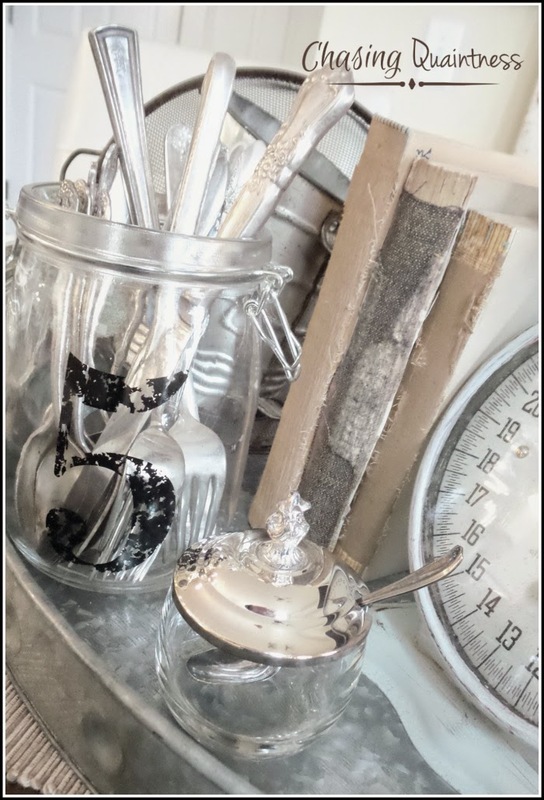 This post has been shared at the Link Party on Savvy Southern Style, A Stroll Through Life, Between Naps on the Porch, and French Country Cottage! What a lovely vignette for a centerpiece. The elements provide interest and freshness. Thank you! When I saw the scale, I knew how I wanted it to look! Thank you again!